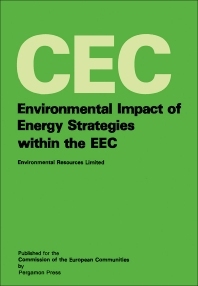 Environmental Impact of Energy Strategies within the EEC is a report prepared for the Environment and Consumer Protection Service of the Commission of the European Communities. The report aims to examine the effects on the environment of the production and use of different forms of energy within the community and to determine the scope for minimizing environmental impact through the adoption of appropriate energy strategies. After an introduction, this report presents in Sections 2 and 3 the summary, conclusions, and recommendations presented at the time of the Nuclear Hearings. The main body of the report is further divided into two parts. Part A contains the assessment of future community energy needs and the forecasts of primary energy supply according to various alternative energy strategies. Part B focuses on the potential environmental consequences resulting from the production and consumption of different sources of energy.